I discover that I can unclip the inner net of my tent and use it alone as makeshift bivy sack. I just throw in my sleeping pad and bag, crawl in, and let the net cover me. I like to cowboy camp, but have had a few encounters with bugs on my face. This little hack prevents bug face. I sleep amazingly well, but not long enough. I wake at 5am and see Milkman, Bumblebee, Seahawk, and Don’t Panic (double triple crown!) already packed and on their way – its 8 miles to more water and shade. I slip out of my bivy, make instant espresso, and eat an apple pastry taken from breakfast at the Best Western in Tehachapi. It tastes great. I mull over the water report and maps. My body is not into this part of the trail: the baby vampire hours, hiding from the sun, carrying of 12 pounds of water, and the feeling of being chased by the elements. Just another 100 or so miles and I’ll be in the Sierras. This is today’s mantra. I shoulder my pack and head to the next water. It’s under pines in a galvanized tank. I’ve heard that it contains uranium and arsenic. It’s most definitely contaminated by cows. I find the Milkman posse lounging in good shade. Seems like everyone but Seahawk wants to take off, so he and I stay behind and he talks to me about his stocks. I find this so interestingly out of place, given our current situation, that it almost interests me. Money. It comes up now and again – doing a thru hike is not inexpensive, but hearing about it this way is like turning on the lights during a shadow puppet play. It ruins the illusion. We decide to hike a few miles and find better shade with more level ground. It’s starting to get unbearably hot (later I find out it was 114 degrees). We hike through more burn and then get back to the land of the living, finding some trees to crawl under. We hide out for four hours waiting for things to cool down a bit. Between the branches, I see trucks hauling motorbikes over a nearby dirt road. My body keeps telling me to run out into the searing sun, to run to the trucks and beg for a ride some place more suitable to people creatures. I tell my body that it will be cooler in few hours. I promise it water and rest. 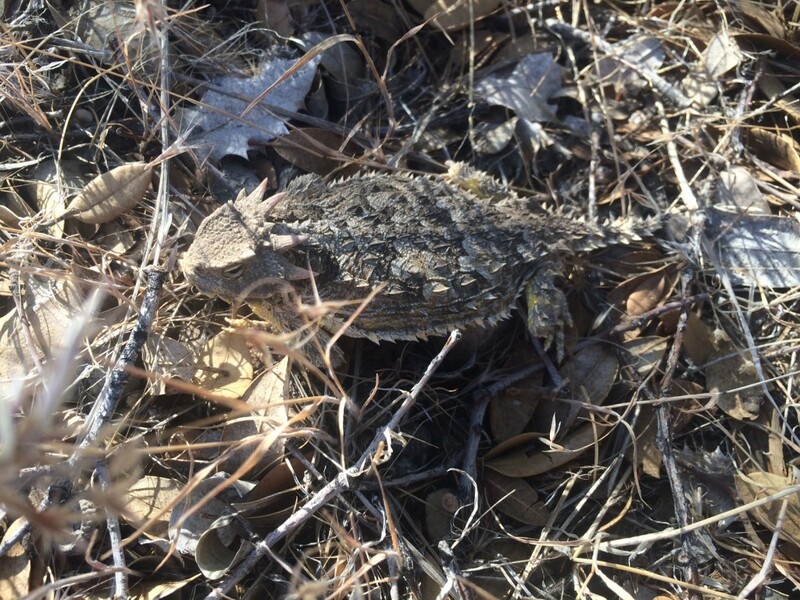 Horned toads – lizards in toad outfits. At 5pm, Seahawk and I make a break for it. We hike 8 miles to Kelso Road water cache that, thankfully, has been recently tended to by a trail angel. We take what we need to get to the next cache 16 miles away. We’ll dry camp tonight and leave before sunrise to make the water that we have go further. As darkness comes, the temperature grows more tolerable. My feet hurt less. Swallowing is easier. V comes up behind us and the three of us climb along the trail, surrounded by boulders and Joshua trees. 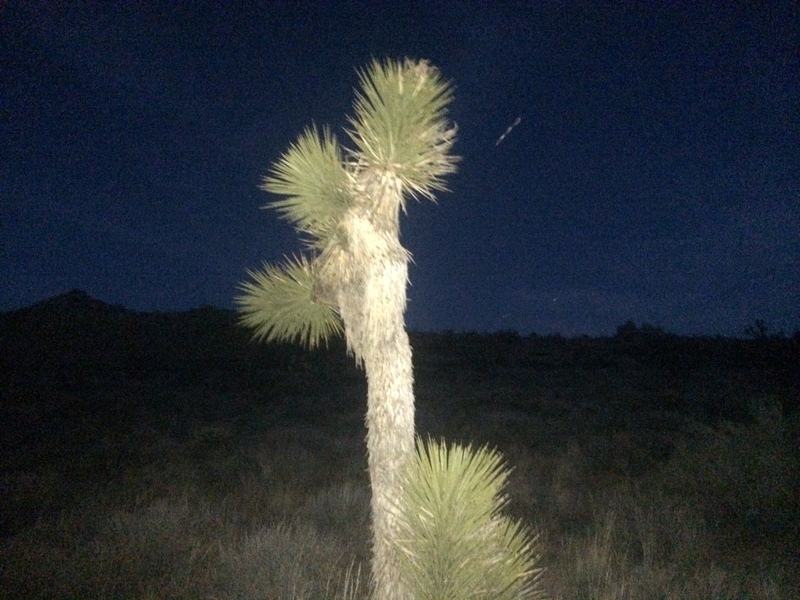 The nearly full moon makes our headlamps unnecessary and, without the sun’s glare, we can finally enjoy the desert. We stop in the middle of the trail when Gin catches us. He tells us that he’s doing a 40. He unplugs his iPod and jazz fills our small collective for a few minutes. Then he’s on his way. We hike 4 more miles. In the distance we catch the glow of headlamps. It’s Bumblebee, Milkman, Kapiko, and Don’t Panic. We join them and all sleep under a Joshua tree grove.